If you're a woodworker with an itch to try something different, take a look at a few free log furniture plans for a change of pace. There's something satisfying about making a piece of furniture that still reflects the unique nature of the original wood. Finished pieces, although usually described as "natural" or "rustic," can be surprisingly at home indoors or outdoors. The environmental movement is helping to fuel different strategies for home maintenance and decorating. If you'd like to create a focal point, decorate a one-of-a-kind child's room or family room, or even just add some old-timey charm to a kitchen, log furniture might be the answer. Log furniture is probably one of the most free form and creative furniture styles. From its beginnings as a pioneer method for creating useful, inexpensive furniture from what was on hand, this versatile style has grown into a 21st century cottage industry. What better way to celebrate nature in your home environment than with furniture that uses natural colors, textures and recognizable shapes from the outdoors to bring a new look to your rooms. This furniture is sturdy, easy to make, and has an artistic appeal that transcends décor styles. The most basic tool for working with logs to build furniture is the drawknife. The drawknife can be used both to remove bark from logs and to make tenons, a type of joint that has a protrusion on the end of one log that fits into a mortise (cavity) in another log. Learning to use a drawknife effectively is a useful, but taxing, skill to acquire. Becoming familiar with drawknife work will give you excellent control over the construction of your pieces. Whether you're using logs that have been sanded smooth or are leaving the inner bark in place, the wood's outer layer will have a big impact on the appearance of your log furniture. This is an area where log furniture really shines. Small imperfections in the wood, like knots, slight bends or ridges, make each piece distinctive. You can control how rustic your log furniture will look, and careful log selection and preparation lets you fashion more artistic pieces than you could achieve with most conventional furniture making techniques.Use only dry wood for furniture. Workable wood will have 15 percent moisture content or less. It takes about a year for most woods to air dry properly. Air dried wood is a solid option for most projects, but the drying process takes time and will create a few cracks. Part of the artistry of working with logs is in showing each element to advantage and concealing imperfections like cracks and unsightly knots. You can also purchase kiln dried woods. 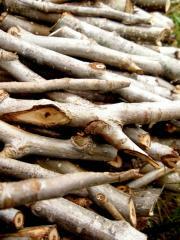 Woods that have been professionally dried have fewer cracks, but they can be quite expensive. Fire killed woods are another potential source of wood for log furniture projects. Forest fires leave standing wood behind that's sometimes usable. Fires will typically burn diseased trees faster than moisture laden healthy trees, so fire killed trees are more likely to be sound than scavenged deadwood. Often sections of bark have fallen off too, eliminating some of the prep work for you. Another option is to search for standing deadwood for projects. Deadwood can be an easy choice, but be careful not to bring home insect infested logs or logs that have concealed dry rot. 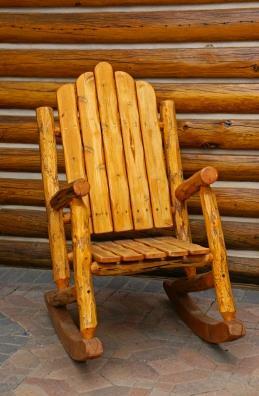 The following sites have free log furniture plans and instructions. There are also a couple of instructional videos at the end of the list that will give you a better idea of what's involved in completing a log furniture project. Log Picture Frame - Great for learning the basics.